After a Bathroom remodel we wanted to avoid the old style sliding bathtub doors and show case the tile work around our tub and allow more light from the window. This DreamLine door allows that and makes a statement too. Word of caution, since it's just less than halfway on the front of the tub when using the shower we do get some splash on the outside but still feel its worth it. The Aqua Uno tub door from DreamLine blends a fresh look with a sophisticated frameless design for an amazing value. The Aqua Uno tub door combines 1/4 in. thick certified clear tempered glass with a striking curved silhouette for a uniquely modern look in a single panel swing door. Add a touch of brilliance to your bathroom with the gracefully curved lines of the Aqua Uno tub door. DreamLine has the ultimate solution for your shower project. Dimensions 1.0 In. X 34.31 In. X 58.0 In. I remodeled a bathroom for my mother and installed a Jacuzzi tub. I had intended on putting up a non-moving screen but changed my mind after the local glass company I hired dropped the ball and failed to show...what the heck people...how do you even stay in business. For not a whole lot more money I found this door and after carefully reading the reviews and checking the measurements pulled the trigger. The door arrived in a giant cardboard carton protected with foam. Unpacking was a small battle. Installation took me a lot more time than the quoted time...My install was made more difficult by needing to drill thru the tile for mounting the hinges and that the angle between the wall and the tub surface was greater than 90 degrees. The door comes with two seals...one that sits flush against the wall when the door shuts and the second that "sweeps" over the tub edge as you close the door. I figured that a small gap against the wall up higher was no big deal relative to the all important seal at the tub and door bottom interface being tight. I had an assistant hold the door in various positions so we could see how the seals would "sit" before we marked and drilled into the tile for the hinges. We corrected with a 4 foot level to make sure the door hung perfectly vertical. I ended up striking a stud with some of the screws and needing to put self expanding screws in the upper hinge. Anyway, the instructions are pure $%&# so I thought I'd include these details for anyone else to hopefully help them in their purchase and install. Also, the hardware for the handle bar and the hinges is beautiful and heavy duty...the seals seem to be of high quality and the door looks great. It is on the shorter side and while showering you must make a conscious effort to not allow water to get by the door. If it did I'm sure it would be a negligible amount. Good luck! 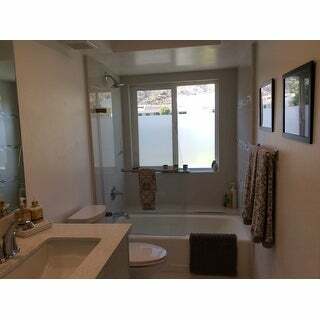 Great glass door, bathroom looks much better now! I had curtains in my tub and decided to move into a glass panel. I did a lot of research and finally bought the DreamLine Aqua Uno. The product is exactly as shown in the pictures and is very easy to install, I did it myself. For the price, this is a great buy and makes the bathroom look much, much nicer. I replaced a 1980's gold shower door enclosure. The look and feel of the bathroom has a much more modern feel with the new door I purchased. The bathroom feels larger with the new door. It was very easy to install. Just be sure to purchase the correct drill bit for drilling through tile. I didn't buy a cheap bit and this made the whole installation very easy. Assembly of the door was easy. The directions were simple to understand. The door arrived within a few days of ordering it. I wasn't sure if the door would keep the water within the bathtub. Since installing it, I have used it several times with no problems. I Highly recommend this door. Very good value. Can't beat the price. Looks great, contractor said it was easy to install. Looks much better than a shower curtain! One concern was that it would not be wide enough to contain the shower water, no issues so far even with our frequent use by Teenagers. Very impressed with this shower door - the quality and style it brings to our newly renovated bath is exactly what we envisioned. Easy install of a quality product. We have an attic bath and while the room is spacious the shower sits under a sloped ceiling. We struggled and struggled for a solution to keep the spa feeling we had already created. We strongly considered a custom installation of seamless glass, but could not justify the incredible expense. Perusing Overstock for products, we came across this door which seemed to provide the perfect resolution to our problem. It did not disappoint - all of the reviews were accurate. It is easy to install. Super quick shipping. Packaged well. No water on the floor - even with children using it. Not cold when showering - we liken it to showering at the outdoor shower enclosures at beach houses. Opens up the bath and is barely noticeable. We had someone come into the bathroom who upon leaving didn't realize there had been a door there - they had to go back and look again! Perfect for the under the eaves/stair showers. Erring on the side of caution (and after multiple measures) we opted for the single door, but there was definite room to go for the fixed panel option with the door. And, you can't beat the price! Very very satisified. Customer service was great too! Will definitely continue to order from Overstock. I was redoing bathroom for 88 year-old mom. The room is very small and bathtub ceiling is oddly shaped since it is right under the upper floor's steps so part of the ceiling is diagonal. Previously, there was a shower curtain which didn't fit perfectly either and ahd to be shortened to accommodate for low ceiling. The only solution was this great door since the measurements would fit the space perfectly. Needless to say, this door is a bargain and my contractor installed it without any problems or having to purchase additional parts. 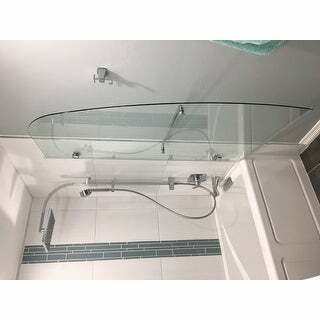 There is only one minor adjustment I will be making to make it safer for Mom and that is: secure the glass at the inside bottom so that it cannot be moved to the inside toward the inner wall; allowing the glass to move only for opening to go into the shower. So far, Mom is happy and the look is beautiful! The price is awesome too. Highly recommended for anyone who wants to modernize a bathroom with the "old fashioned" bathtub. This is a beautiful glass enclosure. I was worried about overspray, but have taken a few showers with it with a pretty high-pressure shower head and its not too bad. There is a bit of spray that does come out beyond where the door stops, but it is a small sacrifice for the beauty of this contemporary door. I love the frameless design. My only wish would be for options of hardware (hinges and handles), so I could match the rest of my oil-rubbed bronze fixtures. Also it doesn't have a stop to keep the door from swinging past the ledge of the tub if you push it in too far. Makes a bold statement in my newly remodeled guest bathroom, and is much more attractive that bypass doors or a shower curtain. I have it installed on a 5'x3' jetted acrylic tub and it works just fine. Showers doors have tracks taht can be difficult to keep clean. This is a trackless door taht does the job and looks upscale. I installed the door myself with some assistance from my son (you wouldn't want to take a chance on measuring, hoolding, etc.) It was installed on a fiberglass tub/shower unit and it fit fine. I was concerned about the slight curve at the bottom next to wall, but the seal worked beautifully. Take you time, measure, and install - enjoy your new shower door! This is a very good buy and I felt like I got a super deal. The glass is high quality and the door has held up well since we've had it (at least 9 mos). My 10-yr-old occasionally splashes water out, but not nearly what I was worried he might. My husband or I can take a shower with no water on the floor. The door actually hinges and moves, which didn't seem necessary at first, but then I realized that makes it possible for you to turn on the shower before getting in. Do keep the outward swing in mind when you purchase. Ours swings perilously close to the toilet, which is next to the shower. It definitely takes two people to install: One to hold, the other to drill. We used a special drill bit so as to not break the whole tile during installation (you can get them at most any hardware store). I really like this door and considered it for our other bathroom. I get nice compliments about it often. How did I order this... and 48 hrs later it's at my house - incredible! Everything inside the bo looks great. Can't wait to tear about my old bathroom & get this installed! Overstock rocks the house! 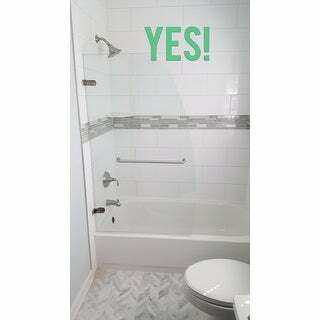 REMODELED 2 BATHROOMS IN THE LAST YEAR & OVERSTOCK WAS THE BEST PLACE TO PURCHASE THIS UP TO DATE SHOWER DOOR. IT IS PERFECT & VERY AFFORDABLE......DELIVERY IS ALWAYS FAST WITH THESE. 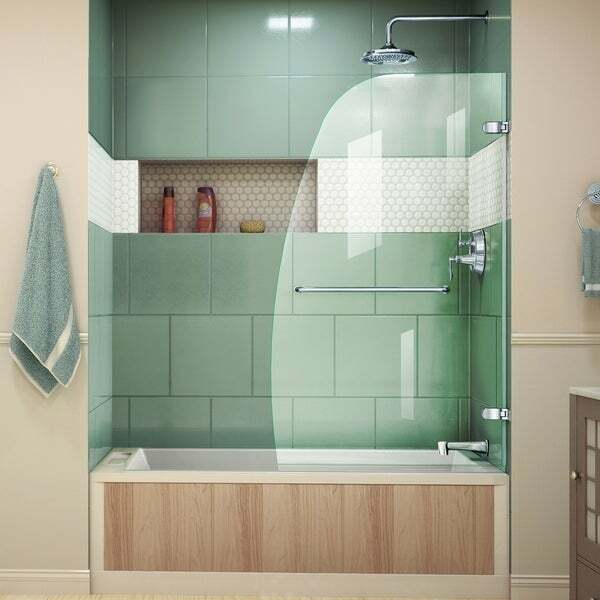 IF YOUR IN THE MARKET FOR A GLASS SHOWER DOOR, CHECK THIS OUT. My handyman made the installation look easy. Great door, clean lines, towel rail a great plus and the seal is perfect - no leakage at all. Overstock strikes again! I put a TON of work into tiling this formerly ghastly 1970's bathroom and didn't want all that work hidden! This shower door is perfect. Easy to install. As you can tell, I had to drill through tile, so I took my time to make sure the door lined up with a stud. Wall anchors are clever in that they allow some play if the holes are not drilled perfectly. There very little adjustment, so make sure your tub is level and wall is plumb (+/- an 1/8" or so) before you buy. Just right for my remodeled bathroom. Stylish. Works great. Easy to install Easy to use Only small issue is the rubber sealer doesn't join at the corner so if you have a guest or kid or a wife who doesn't listen about not spraying water into that small crevice than no need to worry. If you are trying to recreate a water park and think this will block all of the splashes... well you would be wrong. Basically, great idea, good product. Buy it now and have fun showering. The condition of this box was really bad. I am not installing for a week but stay tuned. I’m very worried of condition or missing parts. I will attach a pic later today. Great quality and easy to install. Like most glass shower doors, it has water spots if you do not clean it after showering. The other downside is that it is a little short for my tub. I should have went with a longer option. Water gets on my floor with this one. Make sure you buy the dimensions you want. This door is perfect in my small bathroom. Was easy to install. Did the installation myself. This is the second time we have ordered one of these tub doors for second bathroom. Delivery was fast and installation was not difficult, but did require 2 people. We love the sleek, modern look instead of an old fashioned shower curtain. Wow what a big difference. I would recommend over any shower curtains. Make bathroom with tube more modern and sleek. Easy to assemble. Easy to install. Looks even better than pictured. Updated the look of the bath. Very heavy substantial. My best purchase! It blocks the water from splashing out of the shower and has a modern and clean look so unlike those shore door enclosures that you see all the time. "Does this door swing both ways (into the tub and out)?" This is only able to open outward. "What is the difference between silver and clear?" Silver is for the chrome hardware and clear is for brushed nickle hardware. It's the hardware finish. "I already own this door - can I buy just the stationary panel?" Please contact customer service at this link https://help.overstock.com/app/contact_page for immediate assistance with this issue. "Can this be used on a four part bath/shower surround? or does it have to be tile on the walls to install?" DreamLine shower doors are meant to be installed on smooth, solid walls. If your walls have any give or flex to them, they are not solid and are not recommended. "My shower fixtures are to the left as you face the tub. 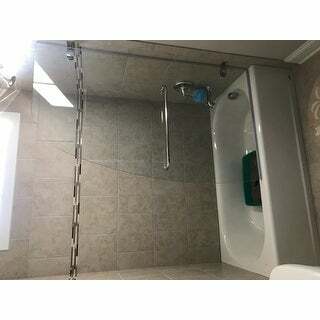 This hinged tub glass door is to the right. 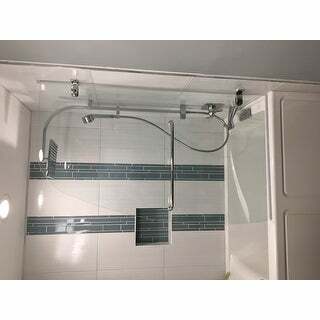 Can I get this hinged glass shower door hinged to the left?" The DreamLine Aqua Uno Tub Door is completely reversible for right wall or left wall installation. "Is there a separate "left mount" and "right mount" door? Or can this one be flipped? I.E., horizontal bar can be mounted on either side?" This door is reversible for right or left side opening. The only horizontal bar with the door is the towel bar/handle which is installed on the outside of the moving door. I hope this helps. "I bought two of these doors for both of my bathrooms - love them! After having them for a few years, the bottom drip rail is tearing and needs to be replaced. Is there a replacement part? I have looked all over online cannot find it." Please contact Overstock Customer Care at 1-800-The-BIG-O (843-2446) regarding replacement parts for your DreamLine Shower Door. Thank you for shopping Overstock!